Civil rights activist and Medal of Freedom winner Sylvia Mendez will be the keynote speaker for UNC Asheville’s activities commemorating the 65th anniversary of the historic Brown vs. Board of Education decision by the U.S. Supreme Court that struck down school segregation laws. Her talk, free and open to everyone, takes place at 7 p.m. on Monday, April 8, in Lipinsky Auditorium. Sylvia Mendez is the oldest daughter of Gonzalo Mendez, a Mexican immigrant, and Felicitas Mendez, a Puerto Rican, who challenged segregation in the courts so that Sylvia and other Latinx children could be provided the same quality of education provided to white students. Her parents were plaintiffs in the landmark Mendez v. Westminster School District (1947) case that ended school segregation in California and paved the way for Brown v. Board of Education. 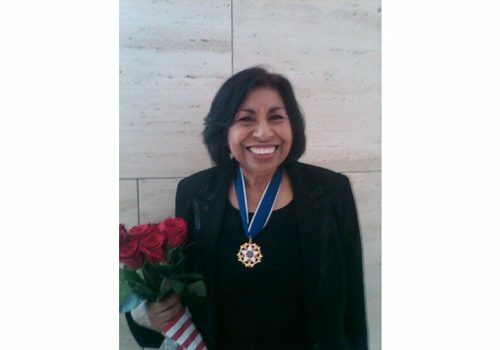 Mendez later earned a Bachelor of Science degree in nursing and worked for 33 years as a nurse at the Los Angeles USC Medical Center, becoming assistant nursing director of the Pediatric Pavilion. She was awarded the nation’s highest civilian honor, the Presidential Medal of Freedom, and she and her family have received numerous awards and recognitions including a U.S. postage stamp commemorating the Mendez v. Westminster School District case. Last year, an English-Spanish two-way immersion school in Berkeley, California was renamed the Sylvia Mendez Elementary School in her honor. April 2 – Documentary Film Screening: With All Deliberate Speed – The U.S. Supreme Court’s desegregation order that accompanied Brown v. Board of Education contained the phrase “with all deliberate speed,” rather than a set deadline, and many communities kept their schools officially segregated long after the ruling and order. This documentary film by Peter Gordon examines the resistance to the desegregation order and will be followed by a discussion led by Tiece Ruffin, UNC Asheville associate professor of education and Africana studies. 7 p.m. in Highsmith Student Union Grotto. April 4 – Exhibition and Opening Reception – In Pursuit of Freedom and Equality: Kansas and the African-American Public School Experience, 1855-1955 – This exhibition, which comes to UNC Asheville courtesy of the Brown Foundation for Educational Equity, Excellence and Research, will remain on view through April 30. Opening Reception from 5-6 p.m. on April 4 in Ramsey Library Special Collections. April 8 – Exhibition – Brown v. Board of Education Decision Text and Legal Reasoning – Large panels displaying and explaining the U.S. Supreme Court’s historic decision will be on view before and after the 7 p.m. keynote address by Sylvia Mendez. 6-9 p.m. in the Lipinsky Hall Lobby. April 9 – Documentary Screening: America to Me – Tsunami of Privilege, a segment of the documentary by Steve James (Hoop Dreams, Life Itself) which delves into the experience of students at a racially diverse suburban Chicago high school, will be screened, followed by a post-film discussion led by Brook Thompson, UNC Asheville Department of Education teacher recruitment and retention liaison. 5 p.m. in the Highsmith Student Union Grotto. April 10 – Community Panel: Memories of Desegregation in Asheville – A panel of longtime Asheville area residents will provide a timeline of the desegregation effort locally, share personal memories, and reflect upon the past events and current realities. Reid Chapman, UNC Asheville senior lecturer in education, will facilitate. 6:30 p.m. in Highsmith Student Union Room 108. April 15 – Stories of Desegregation from the Snowbird Day School 1935-1965 – Assistant Professor Trey Adcock, director of UNC Asheville’s Indian and Indigenous Studies Program, will share the history of the Snowbird Day School which was attended by hundreds of children who were members of the Eastern Band of Cherokee Indians (EBCI). Adcock has led a project combining oral histories, and photo and document collection to shed light on the different experiences at the school which was founded by Quakers but later run by the Bureau of Indian Affairs. The project has been funded by the Whiting Foundation and EBCI. 6 p.m. in Highsmith Student Union Room 108. These events are free and open to the public, and are being complemented by additional education and discussion events conducted privately for UNC Asheville students. For more information, email Tiece Ruffin: truffin@unca.edu. These events are presented with sponsorship from UNC Asheville’s Africana Studies Program, Diversity Action Council, Office of the Provost, Vice-Chancellor for Student Affairs, NEH Distinguished Professor in the Humanities, Pre-College Outreach Programs & GEAR UP, and Belk Distinguished Professor.